Could there be a more life-changing move than one from a stately home on London’s leafy Hampstead Heath to a condo on New York’s Upper West Side? That little jolt of corporate reality is exactly what Lynn Eichenberger faced a few years ago when her banker husband, Stephen, was transferred back to the United States after 10 happy, child-rearing years in England. London had become home for Lynn. So the mission for architect James Wagman and interior designer Celerie Kemble was as much psychological as physical—they needed to transform an architecturally ordinary duplex on the 21st floor of a Depression-era tower into a place with the kind of Old World character and grace their homesick client had grown accustomed to. In the large living room, Wagman raised the room height to a majestic 13 feet by removing a 1960s dropped ceiling. Kemble promptly covered the expanse of walls in an ethereal pale aqua silk. “I think silk creates an emotional response,” she says. 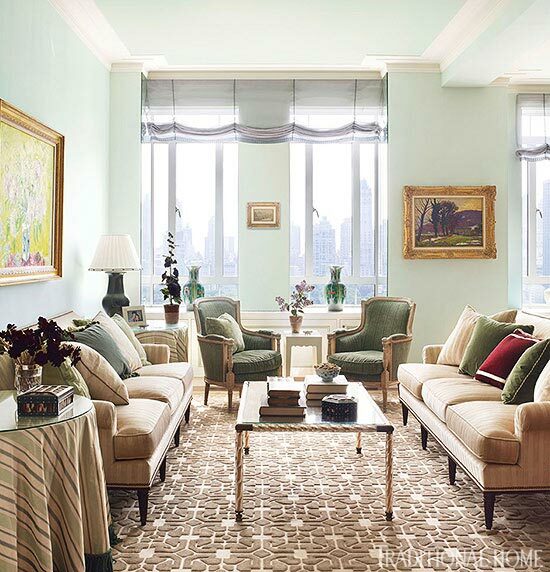 The living room is divided into two well-appointed seating areas—one for more formal affairs with two sofas separated by a delicate glass coffee table, plus two French-style bergères upholstered in sage green. The opposite end of the room accommodates comfy club chairs that swivel to face a television hidden behind a sliding panel in a built-in bookshelf. A bold-textured rug unifies the room while also quietly stealing the scene. But Lynn’s favorite space, and the room in which she spends most of her time, is the kitchen. Wagman combined three small rooms to give Lynn, a former caterer who loves to cook, an expansive kitchen. New French doors lead out to a 2,800-square-foot terrace that wraps the apartment and has astonishing views of Central Park and the Manhattan skyline. “The terrace was just raw space originally,” says Wagman, who reimagined it with a regal (and very English) row of columns and an outdoor living room. In the summer, Lynn’s pots overflow with herbs, hydrangeas, and espaliered apple trees. She grills outside all year long. When Lynn, Stephen, and their children (Sarah, 28, Emily, 26, and Sean, 24) all manage to cross paths for one of Lynn’s alfresco meals, apartment life must seem far closer to those pastoral years across the pond than to the clamor of Manhattan streets below. Architect: James Wagman, James Wagman Architect, LLC, 277 Broadway, Suite 1201, New York, NY 10007; 212/337-9649, jameswagman.com. 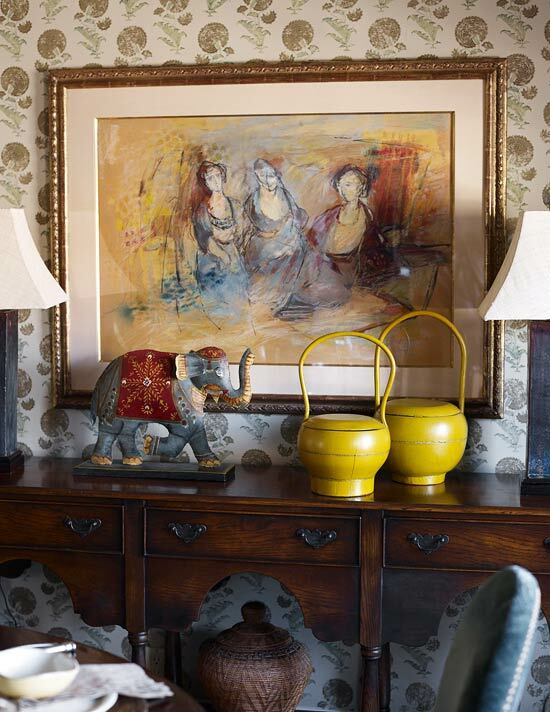 Interior designer: Celerie Kemble, Kemble Interiors, 224 W. 30th St., 13th Floor, New York, NY 10001; 212/675-9576, kembleinteriors.com. Wall covering (Ice Blue dyed silk wallpaper): De Gournay, 212/564-9750, degournay.com. Ceiling and trim paint (“Crème de Mint #2036-70): Benjamin Moore & Co., 888/236-6667, benjaminmoore.com. Sheer drapery (“Colibri”/Celadon #F2658011): Pierre Frey, 866/707-1524, pierrefreycom. Area rug (“East End” in color #AD1381, Collection 1074): Patterson, Flynn & Martin, 212/688-7700, pattersonflynnmartin.com. Pair of sofas (“Carter” #5425-84, by Alexa Hampton); sofa fabric (#2934-11, ivory velvet): Hickory Chair, 800/349-4579, hickorychair.com. Sofa end tables (“Terrific Table”): Ballard Designs, 800/536-7551, ballarddesigns.com. Tablecloth on end tables (“La Scala Stripe” #26-18, by Jagtar): Arnitex, 866/794-9777, arnitex.com. Table lamp (“Mirabella”): Festoni, 713/830-1077, festoni.com. Coffee table: Amy Zook Antiques, 917/991-9605, amyzookantiques.com. Eglomise top on coffee table (custom): Miriam Ellner, 212/807-6316, miriamellner.com. Pair of bergères: Greenwich Living Antiques, 203/274-5130, greenwichlivingantiques.com. Table between bergères (custom): Kemble Interiors, 212/675-9576, kembleinteriors.com. Vases on windowsill (antique, Chinese cabbage vases): Pagoda Red, 773/235-1188, pagodared.com. An armchair from Hickory Chair swivels to face a television hidden behind a sliding panel in the built-in bookcase. A Patterson, Flynn & Martin rug grounds the room. See details of the living room on the following slide. Pair of lounge chairs (“Eton” #320-51); fabric (#3041-10, white solid): Hickory Chair, 800/349-4579, hickorychair.com. Pillow on lounge chair (“Lucy”/Marine #8-2553-LG): Groves Bros., 817/921-4450, grovesbros.com. Side table beside chair (custom, ivory shagreen): Kemble Interiors, 212/675-9576, kembleinteriors.com. Wall sconce (#BLW2002): Nicholas Antiques, 212/688-3312, nicholasantiques.com. Built-in cabinets: design by James Wagman Architect, 212/337-9649, jameswagman.com. Fabrication: Urban Architectural Interiors, 718/292-1266, urban-interiors.com. Console (Louis XVI, by Maison Jansen): Greenwich Living Antiques, 203/274-5130, greenwichlivingantiques.com. 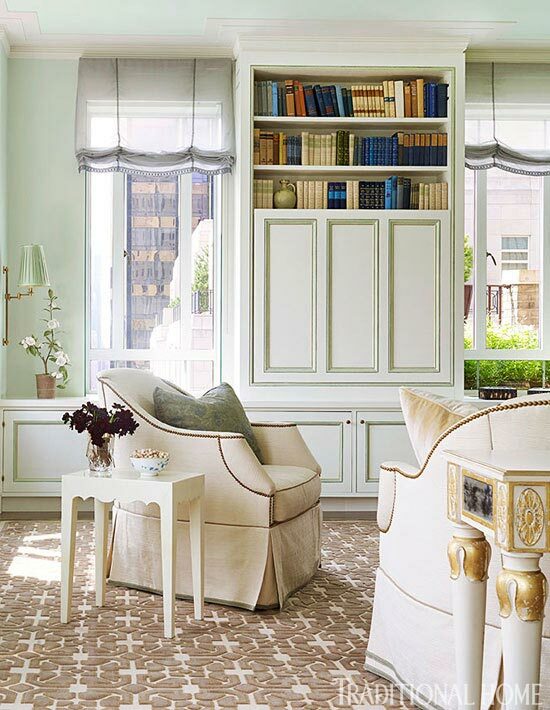 Ivory-colored velvet from Hickory Chair covers the living room’s furniture. 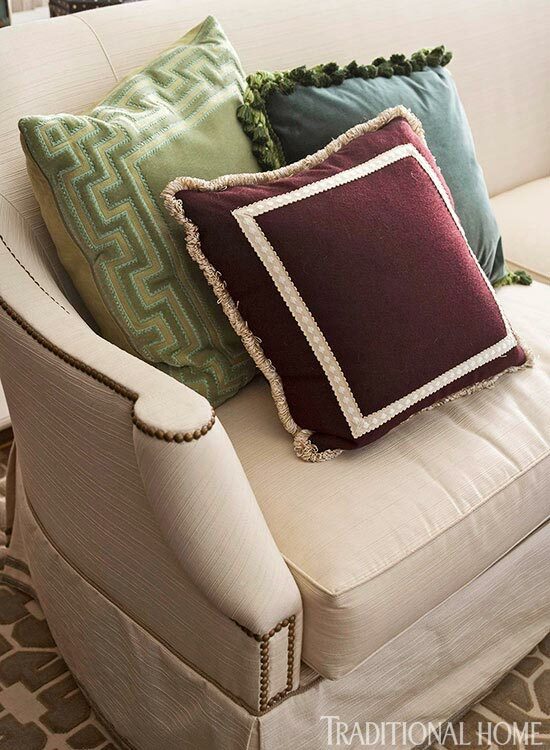 Nailhead trim adds clean-lined details, while the sofa pillows lend sophisticated color. 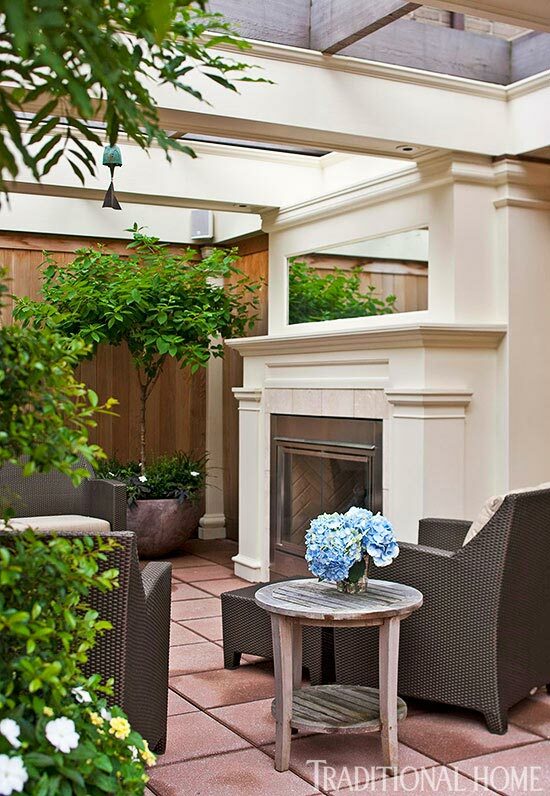 Potted plants and topiaries give the rooftop terrace the feel of a lush garden high above the city. See more of the terrace on the following slides. 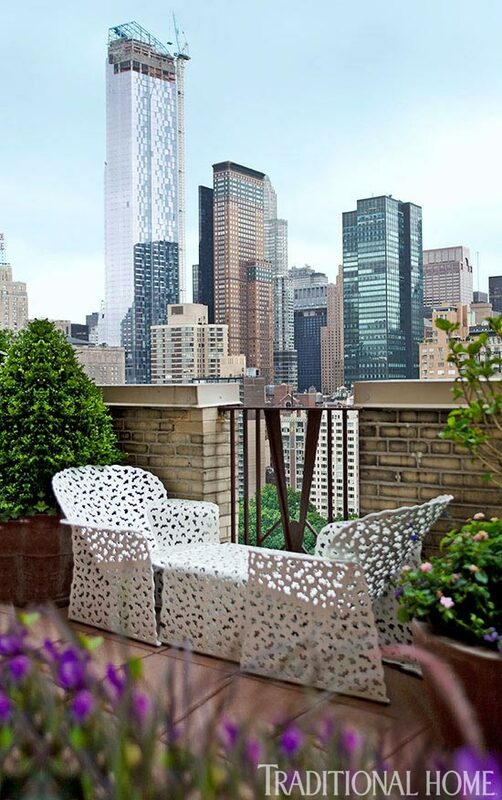 Lacy outdoor furniture from Richard Schultz provides a place to perch and admire the Manhattan skyline. Furniture (Richard Schultz Topiary Collection): All Modern, 800/615-9703, allmodern.com. Steps from the kitchen, a configuration of outdoor furniture and a fireplace sit underneath a shady pergola on the terrace. Mantel: design by James Wagman Architect, 212/337-9649, jameswagman.com. Lounge chairs (Barcelona Collection): Janus et Cie, 310/652-7090, janusetcie.com. Table beside lounge chair (“Fiori”): Country Casual, 800/289-8325, countrycasual.com. 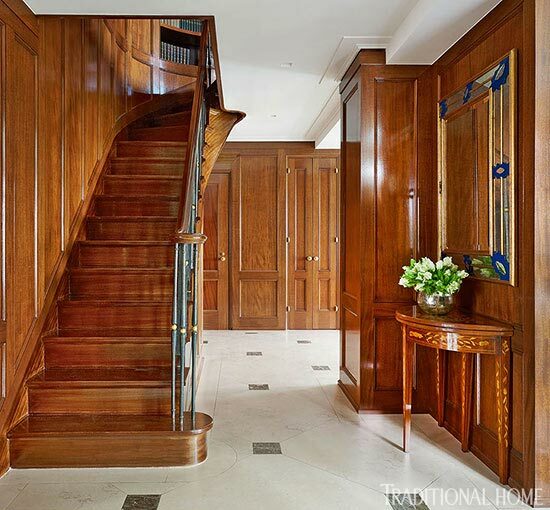 Walls sheathed in waxed mahogany contrast with the matte texture of the limestone-and-marble floors. Flooring (“Giallo Elena”); small squares (“Emperador Dark”): Pro Design Inc., 718/274-4444. Curved shelves at the top of the stairs take the atmosphere of the upstairs library into the hallway. 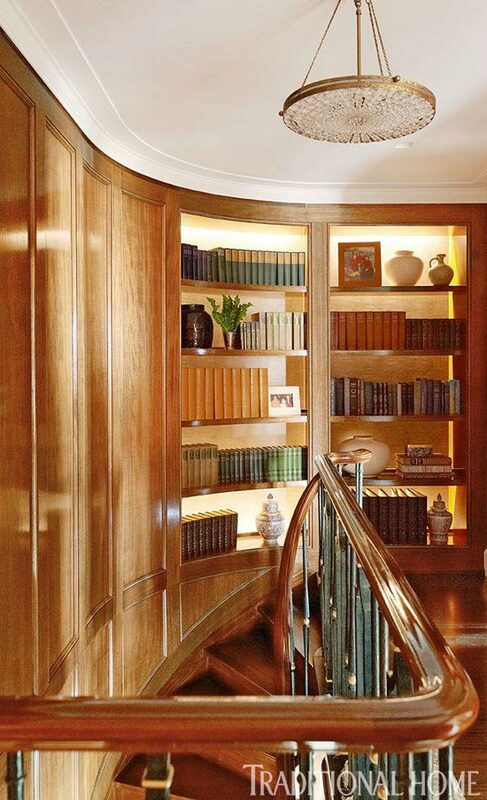 Paneling and bookcases: design by James Wagman Architect, 212/337-9649, jameswagman.com. Lights in bookcases: Studio James Long, 212/255-5495, studiojameslong.com. Hanging light (“Crystal Pendant” #SM-5264-16): Artsy Lights, 212/759-9672, artsylights.com. 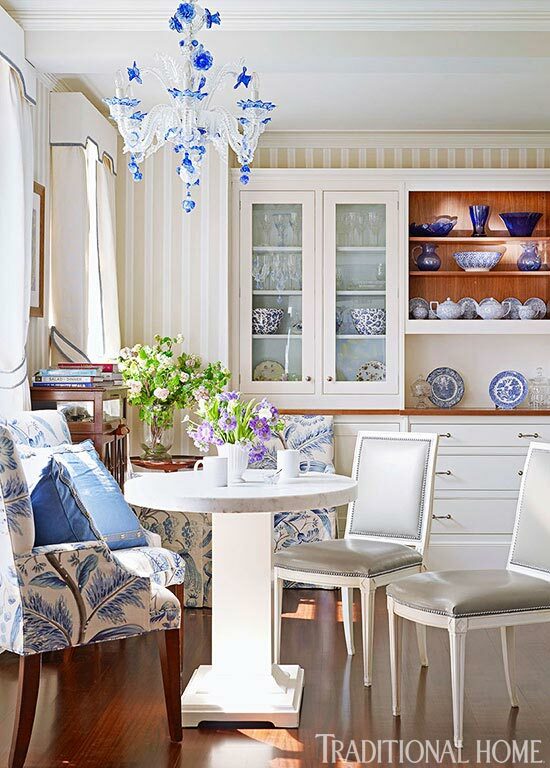 The breakfast nook’s vintage Murano glass chandelier inspired the room’s blue-and-white palette. A custom curved bench covered in a Clarence House toile is Lynn’s favorite spot for morning tea. Wall covering (“Block Print Stripe” #BP710): Farrow & Ball, 888/511-1121, farrow-ball.com. Cabinetry: Smallbone of Devizes, 212/288-3454, smallbone.co.uk. Dining table (custom): Kemble Interiors, 212/675-9576, kembleinteriors.com. Side chairs (“Amsterdam Side Chair” #1552-02, by Suzanne Kasler): Hickory Chair, 800/349-4579, hickorychair.com. Chair-seat fabric (faux leather): discontinued. Toile armchair fabric (“Santorini”/Blue Toile #34050-3): Clarence House, 800/221-4704, clarencehouse.com. Drapery and valance (“Ground Cloth II”/Oyster #2631070): Schumacher, 800/523-1200, fschumacher.com. Wagman reconfigured three small rooms to create the spacious kitchen. 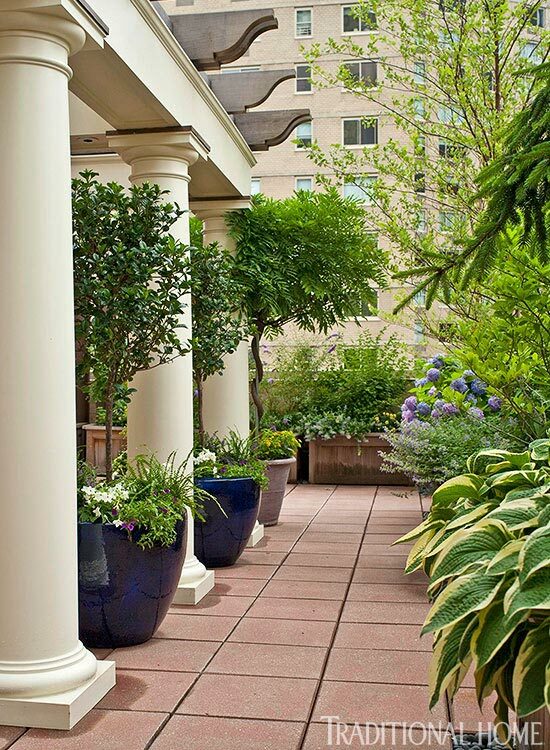 Steps lead to the terrace where the family enjoys alfresco meals along with views of the city. 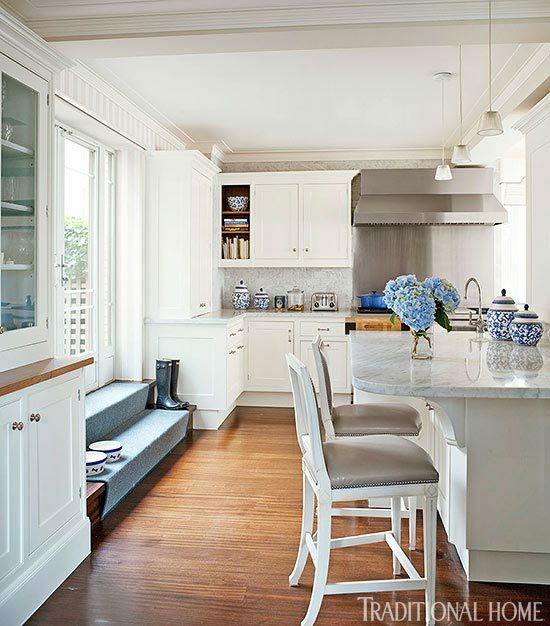 Cabinetry finish (“Mascarpone” #AF-20): Benjamin Moore & Co., 888/236-6667, benjaminmoore.com. Backsplash (pillowed Carrara Bianco): Artistic Tile, 877/237-4097, artistictile.com. Island faucet (“Single Hole Kitchen Faucet with Sidespray” #U.4710. by Perrin & Rowe): Rohl, 800/777-9762, rohlhome.com. Gas range; hood liner (“Pro Hood Liner” #PL582212): Wolf, 800/222-7820, subzero-wolf.com. Stainless steel hood cover (custom): Wainland’s, 800/843-9237, wainlands.com. Pendant lights (“Romeo Babe S Suspension Lamp,” by Philippe Starck, discontinued): Flos, 866/389-3567, usa.flos.com. Counter stools (“Amsterdam” #1552-04, by Suzanne Kasler): Hickory Chair, 800/349-4579, hickorychair.com. A Murano glass chandelier commissioned by Lynn in London lends the lacquered walls even more sparkle. Kemble tucked grass cloth between the ceiling coffers to bring the eye up and make the room feel taller. See dining room details on the following slide. Ceiling and trim paint (“Atlantic Deep” #19-4726, by Pantone): custom mix at local paint store. Dining table; dining chairs; chandelier (Murano); area rug: owner’s collection. Drapery and chair-seat fabric (“Yvonne”/Wheat #8500-T): Groves Bros., 817/921-4450, grovesbros.com. Sconces (by Maison Bagues): antique. Art (by Giovanni Battista Cecchi): owner’s collection. 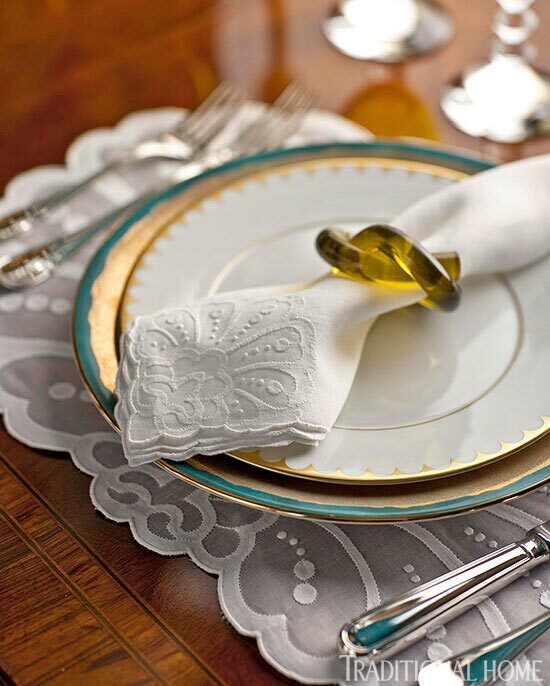 Dainty details in the dining room, like lacey antique placemats and vintage Lucite napkin rings, give the room an air of classic British taste. “We wanted to stay at the end of the day and have a cup of tea,” says designer Celerie Kemble. Dinner plate (“Fortuny”/Teal); dessert plate (“Aegean Filet” #AG6202): L’Objet, l-objet.com. Napkin ring (vintage Lucite knot napkin rings); placemat (antique); napkin (antique): owner’s collection. 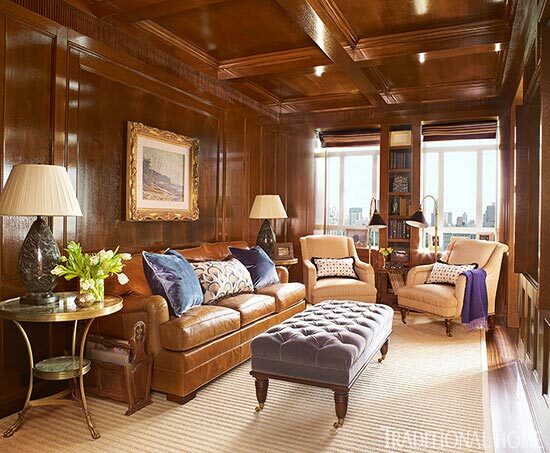 A sleeper sofa from Mitchell Gold + Bob Williams turns the wood-paneled library into a makeshift guest room when needed. The area rug from Merida lightens the space. Paneling (Quartersawn Khaya): design by James Wagman Architect, 212/337-9649, jameswagmanarchitect.com. Sofa (“Classic English Arm Sofa” #811-0122); sofa leather (#2206): Mitchell Gold + Bob Williams, mgbwhome.com. Center pillow on sofa (“Papyrus”/Marsh #PA-02): Katie Leede & Co., 646/707-3569, katieleede.com. Through Holland & Sherry, 212/355-6241, hollandandsherry.com. Ottoman (custom): Kemble Interiors, 212/675-9576, kembleinteriors.com. Ottoman fabric (“Grande Tour”/Raphael #516-90): HBF Textiles, 828/328-2064, hbftextiles.com. Table lamps (“Espresso Grosso” #65173, by Frederick Cooper): Wildwood Lamps, 252/446-3266, wildwoodlamps.com. Sisal rug (“Madison”/Tan): Merida, 800/345-2200, meridameridian.com. Pair of chairs (“Odette”): Mitchell Gold + Bob Williams, mgbwhome.com. Chair fabric (“Lago”/Pinolo #DE10307): Holland & Sherry, 212/355-6241, hollandandsherry.com. Pillows on chairs (“Amun Stripe”/Charcoal #AMS-02): Katie Leede & Co., 646/707-3569, katieleede.com, through Holland & Sherry, 212/355-6241, hollandandsherry.com. Pillow trim (“Ground Cut Fringe”/Chocolate #CF3004-17): Schumacher, 800/523-1200, fschumacher.com. Purple throw: Rosemary Hallgarten, 203/259-1003, rosemaryhallgarten.com. Floor lamps (“Bostwick” #65072, by Frederick Cooper): Wildwood Lamps, 252/446-3266, wildwoodlamps.com. Table between chairs (“Chairside Table” #SF5148): Century Furniture, 800/552-5552, centuryfurniture.com. Drapery (“Palpana”/Siena #DE11281): Holland & Sherry, 212/355-6241, hollandandsherry.com. 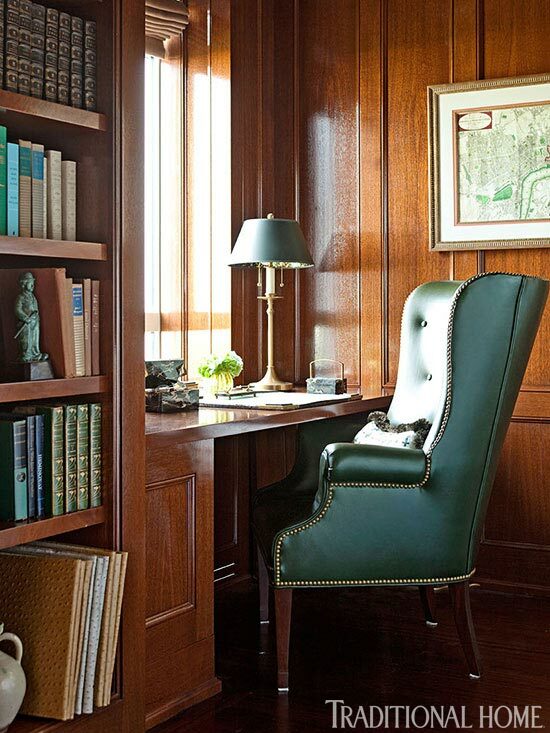 Wagman designed a mahogany-enveloped niche overlooking Central Park as a built-in work area for Stephen. Kemble made it comfy with a wing chair from Hickory Chair. Wing chair (“Isaac Wing Chair” #382-55); fabric (“Saltaire Fern Leather”): Hickory Chair, 800/349-4579, hickorychair.com. Desk lamp (“Dorchester Table Lamp” #CHA8188/ABB, by Visual Comfort): Circa Lighting, 877/762-2323, circalighting.com. 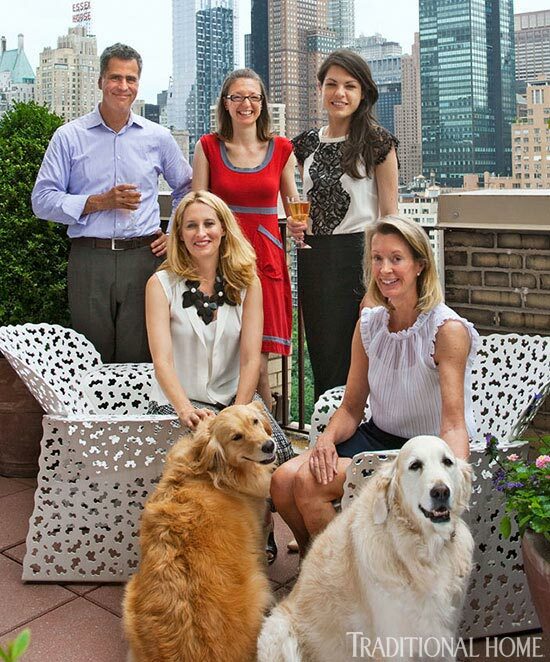 (Clockwise from front right): Homeowner Lynn Eichenberger and her golden retrievers Molly and Maui, Celerie Kemble, James Wagman and Anne Bannon of James Wagman Architect, and Kristen Wilson from Kemble Interiors. An Art Deco-style archway references the building’s pre-war architecture and adds charm to the space. 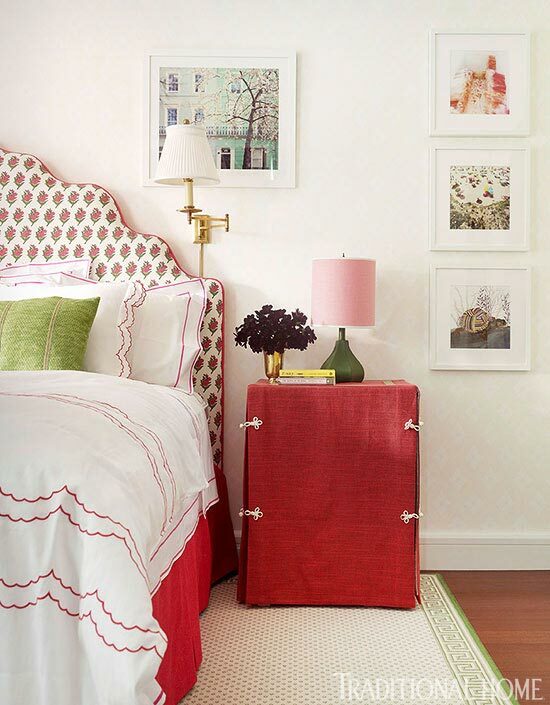 Draperies, headboard, and bed skirt are fashioned from a striped fabric from Pierre Frey. Wall fabric (#2836-11, cream textured plain): Hickory Chair, 800/349-4579, hickorychair.com. Area rug (“Madrisa Freilage” 800): Patterson, Flynn & Martin, 212/688-7700, pattersonflynnmartin.com. Bed (custom): Kemble Interiors, 212/675-9576, kembleinteriors.com. Striped headboard, bed skirt, and drapery fabric: Pierre Frey, 866/707-1524, pierrefrey.com. Bed cover; throw: D. Porthault, 212/688-1660, dporthault.com. Wall sconces (“Simple Scallop Wall Sconce”#BBL2017, by Barbara Barry, with custom shade): Circa Lighting, 877/762-2323, circalighting.com. Bedside chest (“Commode with Fluted Carving” #GUS046, Gustavian Collection): Chelsea Textiles, 908/233-5645, chelseatextiles.com/us. Benches under window (“Ian Bench” #5423-30, by Alexa Hampton): Hickory Chair, 800/349-4579, hickorychair.com. Bench fabric (“Cabaret” #REG01003, discontinued): Zoffany, 212/319-7220, zoffany.com. 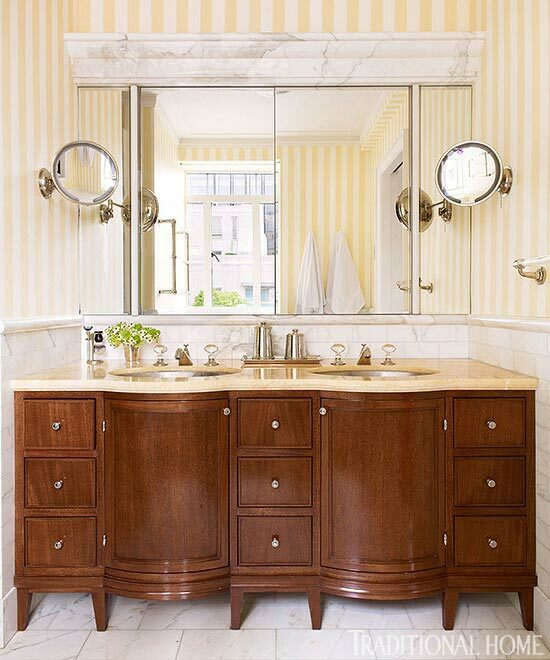 Mirrored cabinets from Robern stand out against walls covered in Farrow & Ball’s “Broad Stripe” wallpaper. Wall covering (“Broad Stripe” #ST 1309): Farrow & Ball, 888/511-1121, farrow-ball.com. Flooring; wall tile: Calacatta Gold. Vanity cabinet: design by James Wagman Architect, 212/337-9649, jameswagman.com. Mirrored cabinet (custom): Robern, robern.com. Sink (“Normandy”); faucets (“Opus”): Waterworks, 800/899-6757, waterworks.com. Dressed in a lively Muriel Brandolini print, the headboard harmonizes with a raspberry bed skirt in a Cowtan & Tout linen. See more of this bedroom on the following slide. Headboard (custom); bedside table (custom): Kemble Interiors, 212/675-9576, kembleinteriors.com. Headboard fabric: Holland & Sherry, 212/355-6241, hollandandsherry.com. Bed linens (“Ansonia”/Azalea, by Matouk): Fine Linens, 877/454-6366, finelinens.com. Bed-skirt fabric (“Jules”/Rose Indien #4759-17): Cowtan & Tout, 212/647-6900, cowtan.com. Fabric on bedside table (#28864.97, colorway discontinued): Kravet, 888/457-2838, kravet.com. Table lamp (#1648 in finish #103): Slip, 828/324-4500, weareslip.com. Wall sconce (“Dorchester Swing-Arm Wall Lamp” #CHD5101, by Visual Comfort): Circa Lighting, 877/762-2323, circalighting.com. Area rug (“Balcony 27”/Evergreen on White): Patterson, Flynn & Martin, 212/688-7700, pattersonflynnmartin.com. Art (collection of prints): owner’s collection. Bookshelf interiors are painted green, a touch Kemble says brings order to the colorful chaos of books. Roman shades: Holland & Sherry, 212/355-6341, hollandandsherry.com. Desk chairs (“Alexandra Side Chair” #1516-23, by Suzanne Kasler): Hickory Chair, 800/349-4579, hickorychair.com. Desk-chair fabric (#28864.97, colorway discontinued): Kravet, 888/457-2838, kravet.com. Green paint on bookshelves (“Bunker Hill Green” #566): Benjamin Moore & Co., 888/236-6667, benjaminmoore.com. 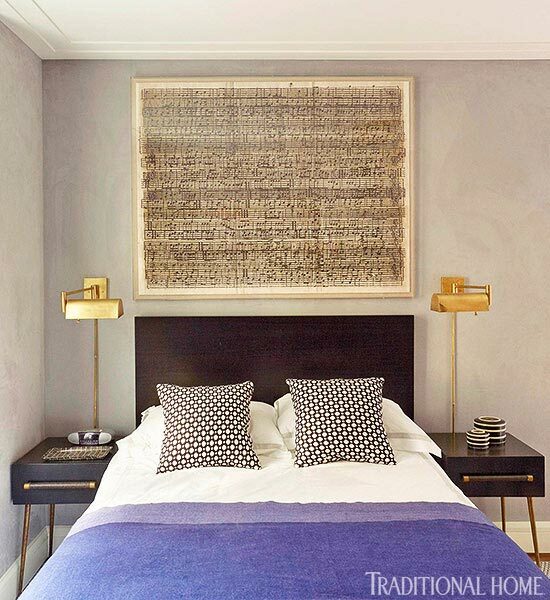 A pair of gold swing-arm lamps from Ralph Lauren Home flank the guest bed, which is dressed in a lavender alpaca throw and graphic pillows designed by Kemble for Schumacher. Bed (custom mahogany headboard): Dog Productions, 718/782-7711. Purple bed cover (Alpaca throw): Rosemary Hallgarten, 203/259-1003, rosemaryhallgarten.com. White bed linens (“Lowell”): Matouk, matouk.com. Black-and-white pillows (“Betwixt”/Black and White #65683, Celerie Kemble Collection); Schumacher, 800/523-1200, fschumacher.com. Art above bed (Cacophony, by Christopher Wilcox): Natural Curiosities, 323/906-1083, naturalcuriosities.com. Bedside tables (“Bedside Table One Drawer” #MID039, Mid-Century Modern Collection): Chelsea Textiles, 908/233-5645, chelseatextiles.com/us. Wall lights flanking bed (“Hunton Swing Arm Wall Light”): Ralph Lauren Home, 888/475-7674, ralphlaurenhome.com. Area rug (“Felted Cable”/Pearl): Merida, 800/345-2200, meridameridian.com. Chair (“Jessie,” discontinued): Schoolhouse Electric Inc., 800/630-7113, schoolhouseelectric.com. Ceiling and trim paint (Decorators White): Benjamin Moore & Co., 888/236-6667, benjaminmoore.com. See another New York City apartment with transplanted style.